Galactus and Deadpool—two guys classified as “bad guys” at one point in time—are going to be Avengers when the Marvel Universe returns to a more recognizable form this fall. And they’re going to have a lot of company, some of whom are coming from alternate universes. The Avengers family of comic books is going to swell to ridiculous proportions when Marvel’s All-New, All-Different initiative starts in October. Six loosely affiliated teams will be headlining titles this fall, with a total of 37 members. Readers will get a glimpse of these various squads in Avengers #0, a preview issue due on October 7. You can take a look at some preview pages below. 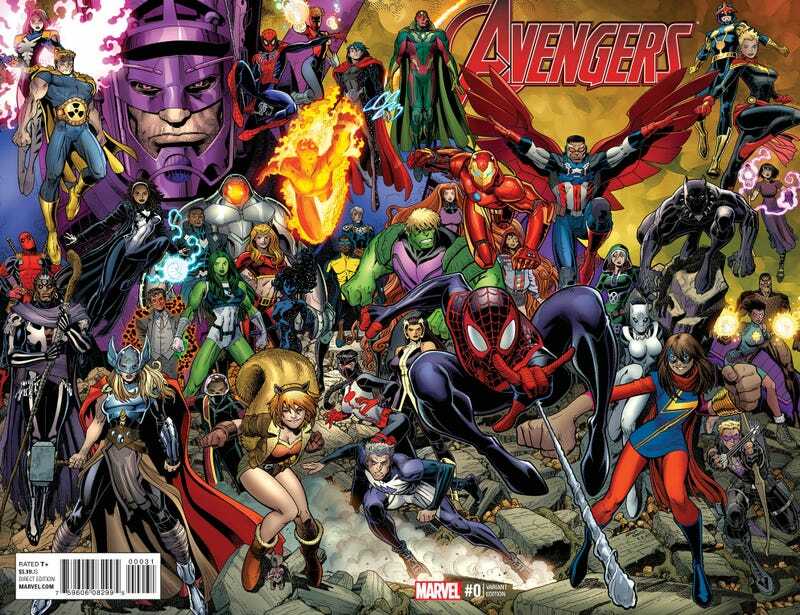 Here’s a rundown of what we know so far about the many, many Avengers assembling next month. The premise of this title is that each character is the sole survivor of their respective realities and that they’ll take harsher measures to maintain the survival of the new reality that they’ve wound up in. Many of the characters from the Secret Wars team book will be showing up in the new series that launches in October. Operating under the Avengers Idea Mechanism shingle, this seems to be a younger crew of heroes led by Sunspot. Just from the aggregate intelligence and powers of the members, this looks like it’ll be the cosmic-level Avengers division. anyone know who the female character is?